Bruegger’s serves authentic New York-style bagels baked fresh all day every day. Bruegger’s respects tradition but isn’t stuck in the past, and we don’t take shortcuts. Bruegger’s isn’t your typical café or quick-service restaurant. We are a real working bakery, using the same time-honored methods that New York bagel bakeries have followed since the early 1900s. And we bake in small batches to ensure freshness. It’s our commitment to bagels done right. And in a sea of choices competing for consumers’ attention, it’s the fundamental difference that sets us apart. Bruegger’s serves breakfast all day, and a New York deli-inspired lunch. Bruegger’s offers a quick, neighborly experience that highlights our keys points of difference – fresh-baked, authentic New York-style bagels, proprietary 100% made-in=Vermont cream cheese, premium coffee, and fresh-made alternatives to fast food. Bruegger's Gift Cards come in convenient denominations that you can redeem in any of our participating locations. 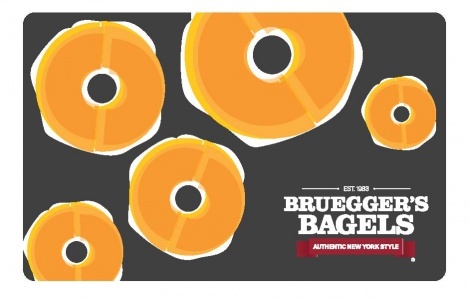 National Gift Card is the best place for you to order Bruegger's Bagel gift cards in bulk. We are the experts in all things gift cards and can set up your gift card solutions program for you today. Please contact us for more information on bulk, direct-to-recipient, or individual gift card fulfillment for your gift card program. Contact us here or call us at 888-472-8747 today! The Bruegger’s gift card can be used for making purchases at participating Bruegger’s locations. Additional value can be added to the card by visiting a participating location. This card is not a credit/debit card and has no implied warranties. The card cannot be redeemed for cash or applied as payment to any account unless required by law. The value on this card will not be replaced if the card is lost, stolen, or destroyed, nor is Bruegger’s responsible for unauthorized use. Use of this card constitutes acceptance of these terms and conditions. After 24 months of consecutive non-use, a service fee of $2.00 per month will be deducted from the remaining balance of the card unless prohibited by law. For locations, more information about fees, or to check your card balance, visit www.brueggers.com or call 1-888-8BAKERY.